Hello my lovelies! How is your week going? I'm well but I still can't wait for the weekend to come. Meanwhile I have another one of the new Kiko shades to show you. It's a polish that doesn't fit the season at all because it's rather dark and vampy. It's actually more of a fall shade in my opinion, but I frankly don't care because I love it. I enjoyed wearing it last week and can't wait to show it to you as well. So here we go. 497, also called Pearly Indian Violet, is a shade that instantly became the most famous among the 60 new shades in the Kiko permanent line. That's because it resembles the coveted Chanel Taboo. It seems that they are not exactly the same, but I think that doesn't really matter when you can spend 2.5 euros instead of 21. If you wish to see for yourself how they compare, there's a very good comparison post over at Love, Varnish, Chocolate and more. What I can tell you is that 497 is pretty hard to photograph. All my pictures were taken in direct light and I still couldn't fully capture the sparkles in this polish. Basically, it consists of a dark purple jelly base that is packed with tiny burgundy shimmer and sprinkled with larger purple iridescent shimmer. It's a party in a bottle, trust me! 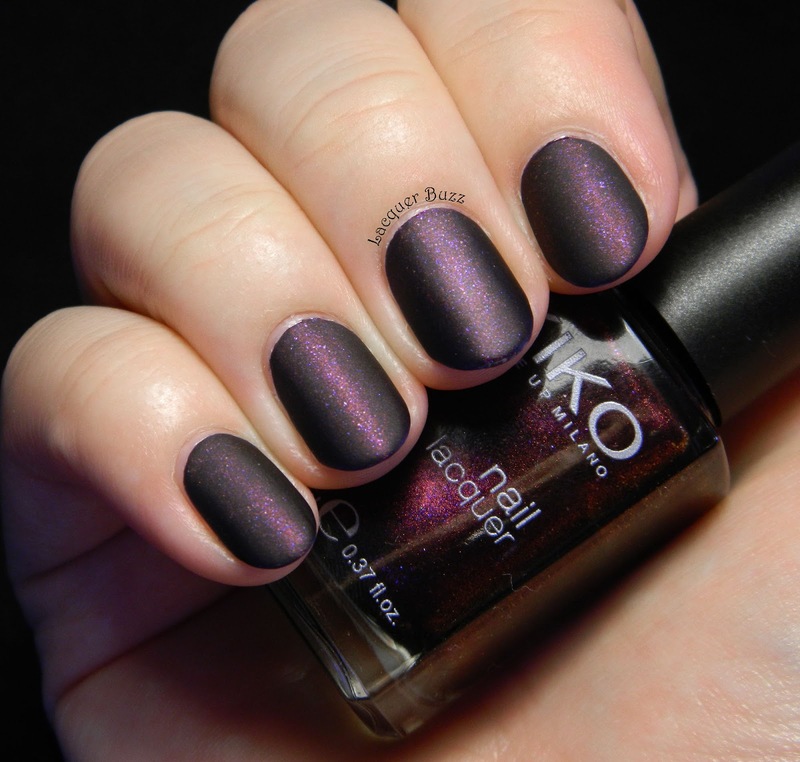 This beauty applied perfectly in two coats, but I guess that's not a surprise since it's a Kiko polish. I added top coat to make it shiny because it has the tendency to dry a bit dull. Given that there's so much shimmer in this, I decided to mattify it after wearing it shiny for a day. Sadly it didn't look as good as expected. Please excuse the weird color of my skin in this picture. I expected for the burgundy shimmer to stand out more and make it look more velvety. I guess it's too tiny for that. This polish remains a great one to wear shiny, especially in the cold season. I can't wait to experiment with some layering. A coat of Max Factor Fantasy Fire would look great over it. It's such and amazing polish and I'm glad to own it! What a pretty purple! I love the shimmer this color has. It looks nice mattified too.